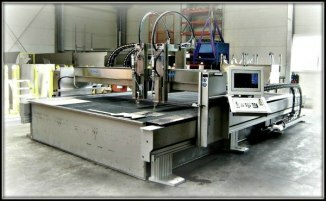 Swedens's leading supplier of waterjet machines! In addition to Sweden, Kimtech has exported waterjet cutting machines throughout Europe, China, Vietnam and North Africa. The company is located in Järfälla, only 20 minutes northwest of Stockholm. Kimtech manufactures and delivers complete turn-key equipment for both pure and abrasive waterjet cutting. The machines are manufactured and developed at our premises by our experienced team. Kimtech has a complete stock of waterjet components for immediate delivery and we are always ready to give our customers service and support. The user-friendly machine software is specially developed for precision waterjet cutting to deliver excellent results. HP-pumps and cutting heads are made by Flow Corp.